Today the Church celebrates two of Christianity's greatest saints — Peter and Paul. We remember that each had his personality flaws. Peter was impetuous, talking big but sleeping or slipping away at crucial moments. The teensy church of Quo Vadis in Rome marks the point — according to legend — where Peter, fleeing the persecutions, met Jesus on the road. Where are you going? (quo Vadis?) Christ says: I am going to Rome to be crucified again. Peter turned back; his chains are the sign of that willingness to follow Christ even to death. Paul certainly had a temper! He confronts Peter with his hypocrisy, refuses to sail with John Mark, and writes stern reprimands in many of his letters. Even so, his love for Christ and service to the churches, his understanding that love is not a warm feeling but a deep and abiding commitment to all that is holy and good in the other — these show even more than his irascible nature. We have two diocesan sees within 5miles of each other. I hope Duluth's Bishop Paul Sirba gets a free moment to be with his friend, Superior's Bishop Peter Christensen to celebrate their name day. 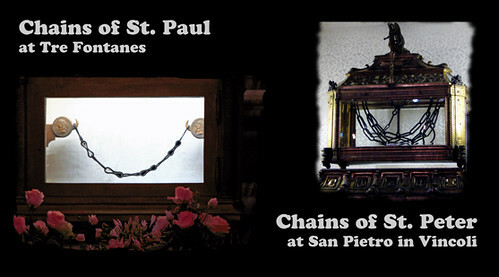 For my part, I remember St Paul's words, and will pray for each of them, remembering their chains.